When night night comes, it's the best time for bats to travel. 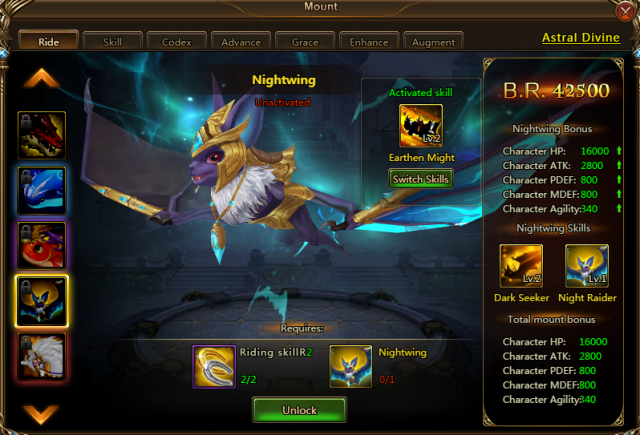 New mount Nightwing comes to League of Angels II to assist warriors in battle. Nightwing has extraordinary hearing and tracking ability, which makes him a perfect night killer. Let's take a closer look at this mount. Nightwing is an Artifact Grade mount. His unique skill Dark Seeker can increase ATK, Agility and Dodge of the entire squad for 5 rounds, which will greatly boost the squad Battle Rating. Increase ATK, Agility and Dodge of the entire squad by 19.5% for 5 rounds. Increase own Crit and Crit DMG by 21% and ATK by 28% until the end of the battle. Participate in the upcoming Treasure Grab event from Sep. 21st to Sep. 23rd and you'll get the chance to ride powerful new mount Nightwing! Stay tuned for more great content coming to League of Angels II. Last：New Suit Academia Sorceria Turns Magic Book into Wings! Next：New Angel Umbra Comes to Fight with You!